If you go to somewhere else for Thanksgiving, do you still cook a turkey anyway? I know a lot of people HAVE to have some leftovers, or s special dish that they grew up with or it just isn’t Thanksgiving. The other day Hungry Husband asked, “If people make such a big deal about turkey, why do they only have it once or twice a year during the holidays?” Good question! You can have it any time of year, but tradition is tradition and I guess it’s just not the same to fix a turkey dinner for Memorial Day! We are going to my nephew’s house this year which will be tons of craziness, and everything else that goes with a big family day, but HH insists that he have a turkey to cook, just for us, sometime over the weekend. 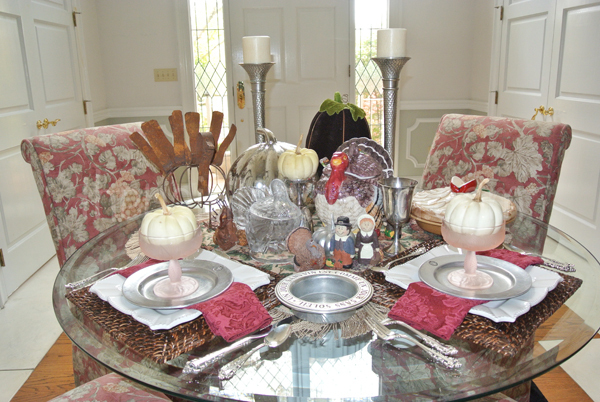 I am going to surprise him with a little table for two, set just for us, to honor his BELOVED turkey! 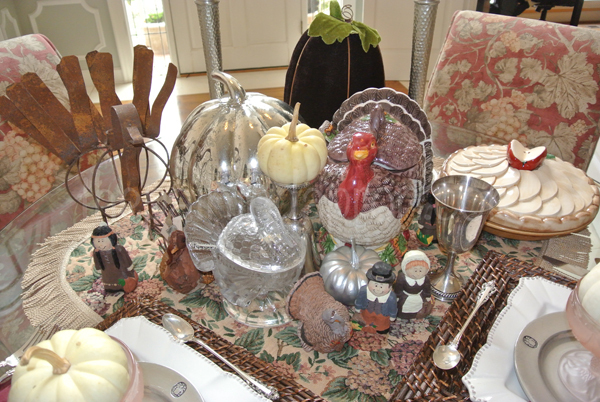 I called for a “turkey conference” on the foyer table…well, okay, I gathered up all the turkeys I had in various places and put them front and center. 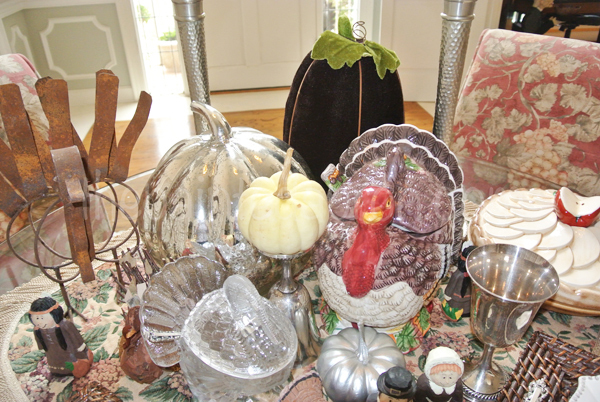 Then I brought in a mercury glass pumpkin and a velvet pumpkin and some mini whites to nestle among the turkeys and pilgrims. 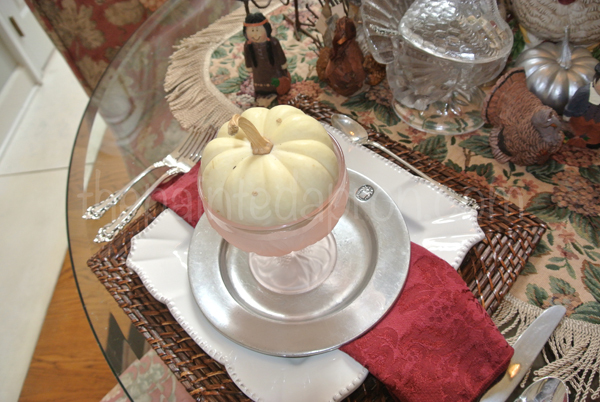 I layered the place setting with rattan chargers, a square white dinner plate, a pewter salad plate, and a frosted compote for Cranberry Sorbet. 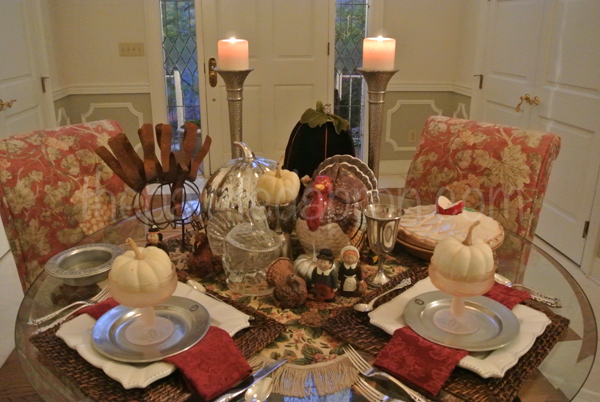 The covered apple pie dish in the background helps carry the burgundy color around the table. and it’s going to be Romantic too! Boil cranberries in water for 8 min. Puree and freeze. Serve frozen as a compliment to the heavier holiday dishes. Saute 2 cups of almond slices in a large skillet in 1-2 T BUTTER and a dash of Olive oil to keep butter from burning. Sprinkle the nuts liberally with brown sugar and Kosher salt. The butter will melt and caramelize on the nuts. Stir often and watch carefully so the nuts don’t burn. When they have begun to brown turn out onto wax paper or foil to cool. Store in a jar in your pantry or freezer. Makes 2 cups. Melt butter, blend in flour and seasonings. Add milk and cook slowly until thickened, stirring constantly. Pour the onions into a well greased baking dish. Pour sauce over all and sprinkle with nuts. Bake at 400 for 20 min. Rinse chicken and pat dry. Place in a lightly greased 13 x 9 baking dish. sprinkle evenly with soup. Stir cranberry sauce and spoon over chicken. Top evenly with dressing and cover with foil. Bake at 400 for 40 min. Reduce to 350 and remove foil and bake for 20 more min. Enjoy the special moments of this wonderful family holiday! 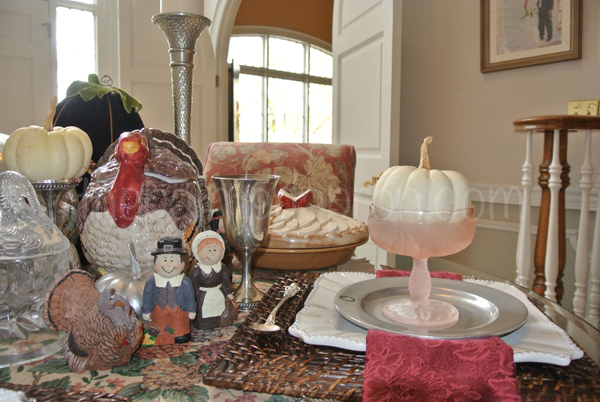 Happy Thanksgiving to you. Your table for two is perfect! 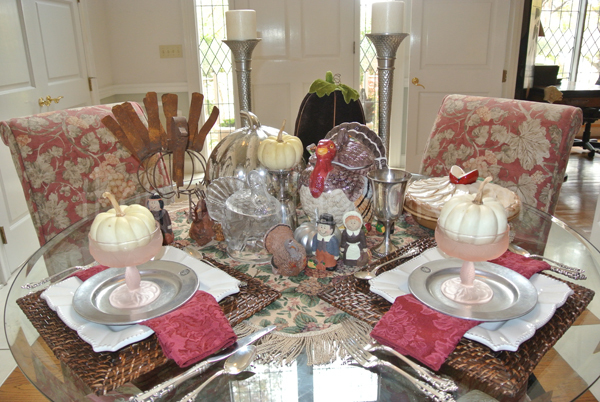 Cute turkey themed table for two. I think I have to try your updated green bean bake. Thanks Carlene, I forgot to link the caramelized almonds, but you can find the method/recipe at the end of the post dated Oct.29. Thanks so much for your visit!